Combination of the words "coder" and "nic" has given birth to a cool business name Codernic, with great applicability and it is optimum for an engineering institute, a software company as well as an insurance company. An innovative revision of the word "bolster". It is a creative business name tailor-made for companies looking to convey professionalism and creativity; Bloster befits fitness, insurance, and tech companies impulsively. An innovative blend of "hand" and "crypto" forms a creative business name ideal for a wide range of business. It connects greatly with cryptocurrency, beauty, marketing as well as social media. Sell emphasizes an ecommerce business and "change" could be understood as a fresh start. Thus making it a catchy name for businesses of sales and purchase of new as well as used items. A straightforward name tailor-made for businesses with specializations in automobiles, marketing, accounting, and technology. This cool business name is simple, which makes it effortlessly memorable. Rootrobo has alliteration effect, which makes it a preferable brand name as it is easily remembered. It has the potential to make the customer base stronger. The ultimate choice for computing, business, marketing business. A sturdy name invented for businesses possessing zeal for technology and its applicability. Incorporation of "charge" with "biz" gives this brand name an electric energy. Perfect for corporations with highly enthusiastic personnel. Bill and "flare" combined together makes a very reliable business brand. It is a solid name offering an easily recognizable sound with great brand appeal to attract and retain your customers forever. The term billmove clearly depicts the tasks related to money. Thus, making it an ideal match for a finance company, cryptocurrency business or banking sector looking for a cool business name. Watch the customers lining up by taking the benefit of this tech-savvy name. "bid" and "charge" combined together forms a powerful brand name for creative ecommerce, accounting or services business. A game changer in the industry! A very tech-savvy business name, Chargeuser conveys a fantastic appeal for a merchant company, a payment company or a web based services business. A very clear and straightforward name with a power to stick to the minds! Geek is a buzzword in the computer world and "inter" is a reminiscent of the word ''interview''. This catchy brand name simply suggests of a marketing, operations, or insurance business constituting of intelligent and reliable people. Amalgamation of words "fix" and "intel" results into a name with very crisp and smooth sound. Fixintel is a professional business name certainly capable of sticking to user's mind absolutely for technology, consulting or services company. 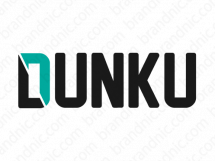 Dunku is a 5-letter brand name built around "dunk" with very decent and endearing vibes. It is perfect for companies dealing with products or services related to kids, for instance, apparel, games, sports or education. A brand with an appealing look worth buying.